Are you craving for pizzas? 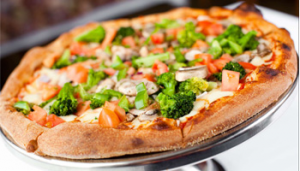 Time to switch on to incomparable hygienic, flavorful and tasty veggie pizza! In this particular pizza recipe, except cheese all other ingredients are home made. It is a basic veggie pizza where you may easily use your own assorted vegetables along with onion and capsicum. You may Click Here to get an idea of Tempting Indian Pizza Recipes – A Must Try! You may also include basil and dried oregano for enhancing the flavor of the sauce. The pizza bread is prepared by taking into usage all purpose flour. For a dense base, you may take into usage wheat flour. Its preparation time comprises of 2 hours 20 minutes and cooking time is about 20 minutes. Total 2 hours 40 minutes! Can be served up to 5 people easily! Measuring cup of 250 ml has been taken into usage. For brushing purpose, olive oil has been used. For sprinkling purpose you may use flour, semolina or cornmeal. Sprinkled sugar in warm water along with yeast and stirred. Allowed the mixture to settle at room temperature for maximum 15 minutes till it becomes frothy. Added one cup of flour, olive oil, salt and a frothy mixture of yeast in a bowl. Stirred and added one more cup of flour. Stirred again till the mixture became sticky in nature. Added one more cup of flour and continued stirring. Kneaded the dough into a smooth and springy ball. Applied a small amount of olive oil all over the dough. Covered the dough loosely and kept the same in a large bowl at room temperature for about two hours. Finally, the dough will get doubled up and leavened in a nice manner indicating it’s ready to use state. The pizza can be also prepared in a food processor. In case the dough is not soft and a bit dry, then some amount of warm water must be added. The vegetables can be sauté lightly in olive oil for good taste. The left over portion of the pizza can be easily refrigerated.